Following the release of the initial teaser trailer for Laika Entertainment's upcoming feature film Kubo and the Two Strings, fans of the Portland-based animation studio have undoubtedly been wondering just what sort of shape the new film would take on following the fairly enigmatic footage that viewers have been offered thus far. The latest film from the makers of such past critical successes as ParaNorman and The Boxtrolls will be set within a cinematic world of Japanese lore, wherein one young boy must come into his own and accept his fabled samurai heritage. The new film will star Game of Thrones actor Art Parkinson in the lead role, and he will be joined by the likes of Matthew McConaughey, Charlize Theron, Rooney Mara, and Ralph Fiennes in supporting roles, all of whom appear to be sounding at their very best in the latest feature length trailer from distributor Focus Features. As seen in the footage featured above, Laika's latest effort will no doubt be one of epic proportions, featuring Kubo and his two faithful companions Monkey (Theron) and Beetle (McConaughey) engaging on an epic quest away from their sleepy hometown in order to engage in battle with a spirit from the past and uncover the mystery surrounding their hero's late father. Here's the official synopsis. "An epic action-adventure set in a fantastical Japan, kindhearted Kubo ekes out a humble living, telling stories to the people of his seaside town, including Hosato (George Takei), Akihiro (Cary-Hiroyuki Tagawa), and Kameyo (Brenda Vaccaro). But his relatively quiet existence is shattered when he accidentally summons a spirit from his past which storms down from the heavens to enforce an age-old vendetta. Now on the run, Kubo joins forces with Monkey and Beetle, and sets out on a thrilling quest to save his family and solve the mystery of his fallen father, the greatest samurai warrior the world has ever known. With the help of his shamisen, a magical musical instrument, Kubo must battle gods and monsters, including the vengeful Moon King (Fiennes) and the evil twin Sisters (Mara), to unlock the secret of his legacy, reunite his family, and fulfill his heroic destiny." Fans of Laika's past cinematic offerings will be doubt be intrigued by what the studio's latest film appears to offer, though only time will tell whether or not their latest motion picture will live up to past successes. But with any luck, Kubo and the Two Strings will prove to be just as magically inspired as past animated epics such as the studio's initial masterwork Coraline was back in 2009. For now, viewers can gaze upon the latest footage from the forthcoming motion picture, and begin to anticipate just where they may yet find Kubo, Monkey, and Beetle when the film finally sees theatrical release later this summer. Until then, you could always revisit past successes from Laika, and wait with bated breath for the now heralded arrival of the celebrated animation studio's latest cinematic effort. 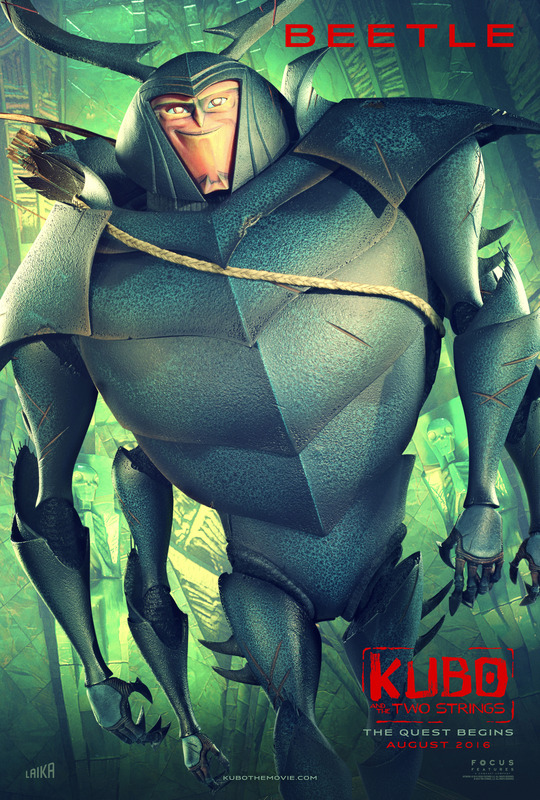 Kubo and the Two Strings will see theatrical release on August 19th, 2016.